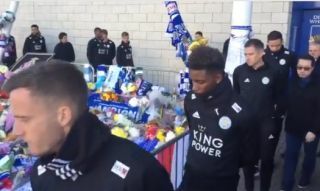 Leicester City players have arrived at the King Power Stadium today to pay tribute to their late owner Vichai Srivaddhanaprabha after his tragic death in a helicopter crash this weekend. The 60-year-old was one of five killed in the accident just by the King Power Stadium, in a tragedy that has shaken the club and much of the city. Srivaddhanaprabha was a hugely popular owner of the Foxes, who helped the club out of administration back in 2010 before helping them to even greater heights as they stunned world football to win the Premier League title in 2016. Many of those players still remain at Leicester, and the likes of Kasper Schmeichel, Wes Morgan and Jamie Vardy can be seen in the video below attending today’s tributes.